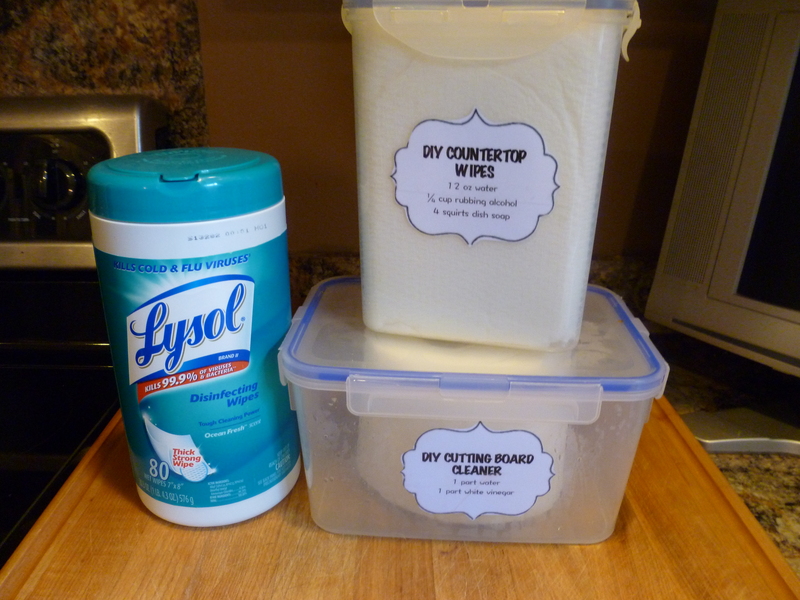 HOW TO KEEP A CLEAN KITCHEN (plus DIY Lysol Wipes)! If you are looking for some of the items featured in this video, they are linked below. Our chop block comes from Wood Welded which is a store in Michigan (my home-state). It is an extremely high quality product, and no, I am not affiliated/paid/perked to say that! The exact price depends on the size you order, but typically an item like this will set you back $50-$100. You know me, I’m CHEAP, and in my opinion, this is worth it to have a quality piece. Ours was a wedding gift and it is one we use daily. For those of you shopping on a tighter budget, or wanting to try a more affordable option before taking the plunge, check out more online options or these highly recommended options…. Thanks for posting this! I made homemade baby wipes and absolutely love them but when I tried a different recipe for cleaning wipes, they were horrible. The mixture was mostly a harsh cleanser so they just fell apart and had a strong odor. I am excited to try your recipe. Do you use these in the bathroom as well? One more question! Have you tried your countertop wipes on glass/mirrors since it is a vinegar mixture? Hi, thank you for your ideas, so fun. For windows and mirrors I have been using, same as my mother, water with vinegar and use newspapers, they are the best. Just crinkle them until manageable and the rest is easy. I just emptied a big tall can of iced tea mix. Do you think it will be okay to make the wipes in there? I think it’s cardboard but it has like wax in the inside. It can fit the entire roll of paper towels. Wonder if it would leak. Another question. Where else can I use the “cutting board wipes?” And if vinegar disinfects what is the difference between the two wipes? And sorry if it’s obvious. My ten year old just looked at me like I was crazy for doing two different kind of wipes so I had to ask because in his science program they made different dyi’s and he says he already knew vinegar was awesome. We use them all over. On Carson’s tray at the end of the day is my other go-to. I like just a vinegar-water solution for the board since it is so simple, disinfects, and is 100% edible (I don’t like the idea of dish soap/alcohol on it since we cook our food there, but it’s not a huge deal if you did). Good luck! Rubbing alcohol is not good for wood. Think about it before you use it. Alcohol dries things out quickly and will cause wood to crack and split. It will dissolve glue. 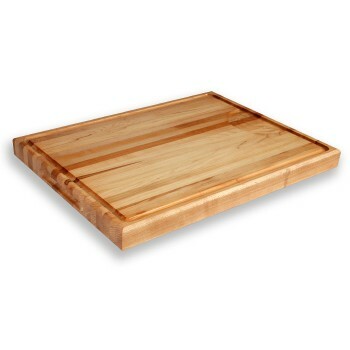 A chopping block type board may be assembled with a type of glue. 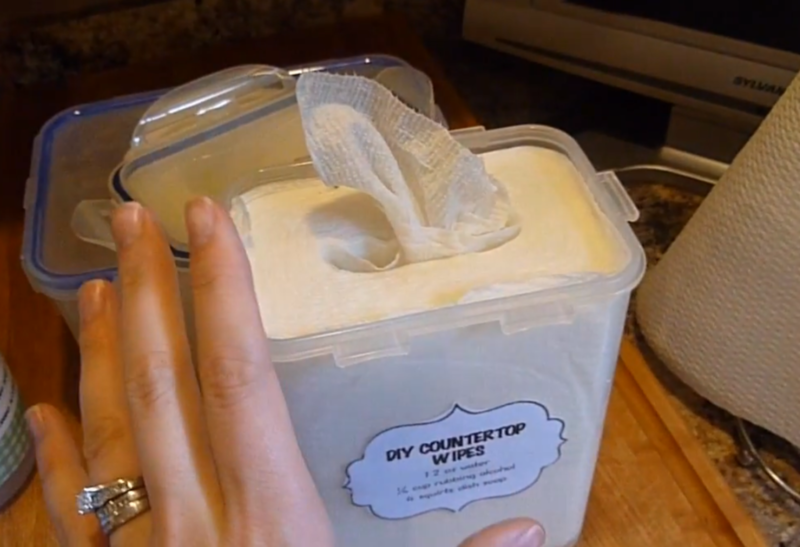 I love the idea of the DIY wipes, i love the wipes for easy use but notice that it sometimes leaves a film on the counter. Very excited to try these tonight and start cleaning. Thank you for your video . Why wouldn’t you use the vinegar wipe instead of the alcohol since it disinfects anyway? Hi! The containers that you store your wipes in look great. I know you said you could get them at any grocery store but I’ve never seen them. Do you have an exact source? Thanks! First, can I say how great you are! I just discovered you recently, and I’m glad I did! You have really fantastic ideas and some great recipes! I already made the counter wipes , but I wanted to make sure that they are safe on granite counters? Do you know? Well it’s late, so if you know that information. Please send me a quick response back at your leisure. WOW. Am gonna try this. I am looking at ways to clean with out so many chemicals and still be clean. But I was wondering, won’t the soap leave a residue? Thanks i am sharing your show to my family and friends. Thanks again. Why wouldn’t you use the vinegar and water wipes to clean your counters? Enjoyed your blog. Great videos.. thank you! I really like how snugly the paper towel roll fits into the rectangular container. Would you be able to tell me what size it is? Do you know where I can buy the containers online? I can’t seem to find any like these ones!! What size is the container you used? Excellent. 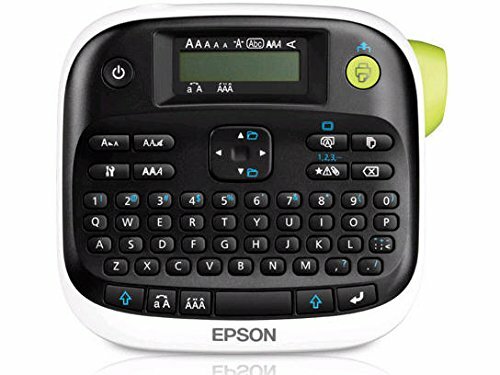 Thanks for sharing the labels to go with. I just wanted to tell you how much I love your kitchen wipes! I am addicted to them & use them for everything. My kitchen stays so much cleaner. Can’t wait to try some of the other cleaners. Thank you for your posts.